This Italian-made stainless steel pasta machine is made by a company that has been making pasta machines for generations, and it’s built to last a lifetime. The included dual-side cutter can make spaghetti or fettucine, but a dozen more accessories are available for machine thin or thick shapes, or even ravioli. A pasta drive motor is also available, so you can turn the hand-cranked machine into a self-powered one. The exterior of the machine can be wiped clean, but the cutters should not be immersed in water. After using, any adhered pasta dough can be left to dry and simply brushed out of the nooks and crannies of the cutters. The handle is removable for more compact storage. If you want a splash of color in your kitchen, this machine comes in eight different colors, along with the traditional silver. The rollers are designed to make a rough-surfaced pasta that holds onto sauce better, as opposed to a slick, smooth pasta, and you can choose from 10 different pasta thicknesses. This pasta machine includes a wide variety of cutters at an affordable price, so it’s great for people who want to learn how to make pasta at home, but who won’t use it every single day. The included attachments make spaghetti, fettuccine, angel hair, ravioli and lasagnette. On smooth surfaces, the machine can tend to slide in use, and because of the handle position, it needs to be used near the edge of a counter. If you’re not sure you want to spend money making pasta that is – let’s face it – cheap to buy, this budget machine can get you started at a low cost. Besides making flat sheets, it has cutters for making fettuccine and spaghetti. The product description says that cutters can be washed in the dishwasher, but instructions included with the unit say that the cutters should not be immersed in water, which is typical of these machines. After using, any adhered pasta dough can be left to dry and simply brushed out of the nooks and crannies of the cutters. The handle is removable for more compact storage. The machine can be temporarily mounted to a counter with the included clamp, but it might not fit thicker countertops. Larger clamps are available at hardware stores, however. If you want homemade pasta with as little fuss as possible, this machine will do it all for you – you just need to add ingredients, and cut the pasta into usable lengths as it comes out of the machine about 15 minutes later. The machine mixes and kneads the dough, then extrudes it through one of the included dies. The included dies make spaghetti, penne, fettuccine, and lasagna. Other dies might be available in the future. This has an automatic shutoff when the process is done, and the shaft is detachable for easy cleaning. An LED display shows the progress. Cleaning tools to fit each die are included for easily removing bits of dough, along with a measuring cup, recipe booklet. Pasta making couldn’t be faster. This machines mixes, kneads, and extrudes shaped pasta in about five minutes. It includes six different dies, so you can use this machine for making angel hair, spaghetti, linguini, fettuccine, flat sheets for ravioli, and hollow tubes for penne or macaroni. If you want even larger sheets, just remove the dough after kneading and roll it out as needed. The mixing bowl is removable for easy cleaning, and there’s a built-in compartment for storing the dies neatly. This is an electric machine at a budget price, so there’s a lot more plastic involved. The mixing, kneading, and extruding parts can all be immersed in water for cleaning. Roller pasta machines are great at making flat pasta but if you’re craving rigatoni or other tube-shaped pasta, you need this machine. With the five included die discs, it can make rigatoni, bucatini, mezze penne, tortiglioni and fusilli. The pasta mixing kit includes a front cap, enclosed lid, and mixing paddle so you can make the dough right in the machine. The cutter spatula cuts the fresh pasta into the lengths you desire. This clamps easily to any countertop and has rubberized feet to protect your counter from scratches and to keep the machine stable. A disc rack keeps the discs organized in storage. This is a manually operated pasta machine, so you can make your pasta anywhere. If you already own a KitchenAid stand mixer, this set will turn your machine into a powered pasta machine, and of course you can use your stand mixer for making the dough. The wide roller is used for flattening pasta sheets that can be used as-is for ravioli or lasagna, or for cutting shapes by hand. The flat roller is also used for flattening the dough prior to using one of the other included cutters for spaghetti or fettuccine. The set also includes a brush for cleaning the roller and cutters. 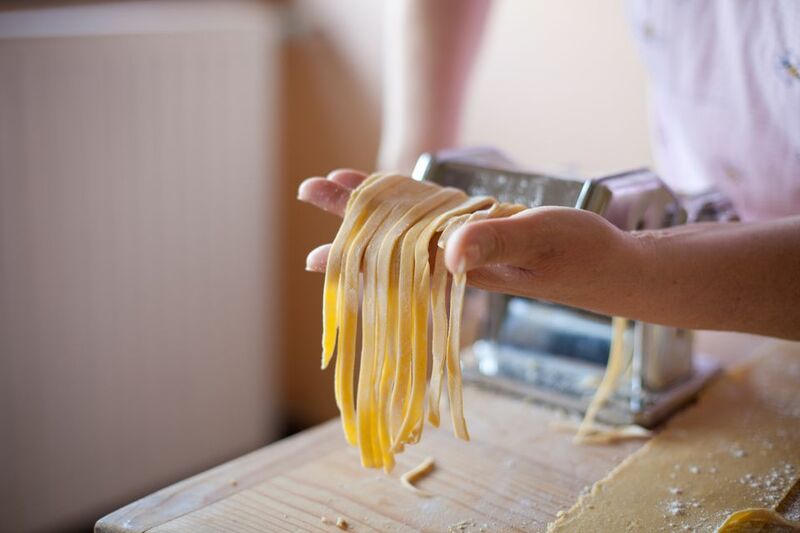 Attaching the roller or cutters to the machine is a little less convenient than the same process on a hand-crank machine, but it’s much more convenient to be able to feed the pasta with one hand and catch with the other while the machine does the “cranking” for you. The roller and cutters should not be immersed in water. After using, any adhered pasta dough can be left to dry and simply brushed out of the nooks and crannies of the cutters. Other cutters, as well as a ravioli attachment, are available separately. Our reviewers spent six hours testing one of our readers’ favorite pasta makers. To get the most comprehensive results, they used it to make several different types of pasta. We asked our testers to consider the most important features when using this pasta maker, from its ease of use to the quality of the final product. We've outlined the key takeaways so that you, too, know what to look for when shopping. Electric vs. manual Electric pasta machines are easier to use than manual ones, but you have to work at the speed of the machine, cutting the pasta to length as it's extruded. With hand-cranked machines, you can simply stop cranking if you need to take a break for a phone call or clear more space on your counter. Dies or cutters Pasta machines with included cutters allow you to make sheets of pasta or cut them into strips for spaghetti or fettuccine. Some machines also have attachments for making ravioli. Machines with dies let you make tubular pastas as well as shaped pasta like rotini. Availability of extra dies or cutters Pasta machines come with a variety of dies or cutters to get you started, but they may not include all of your favorite pasta shapes. Before you buy, check to see if there are additional dies or cutters that you can add to your collection in the future. 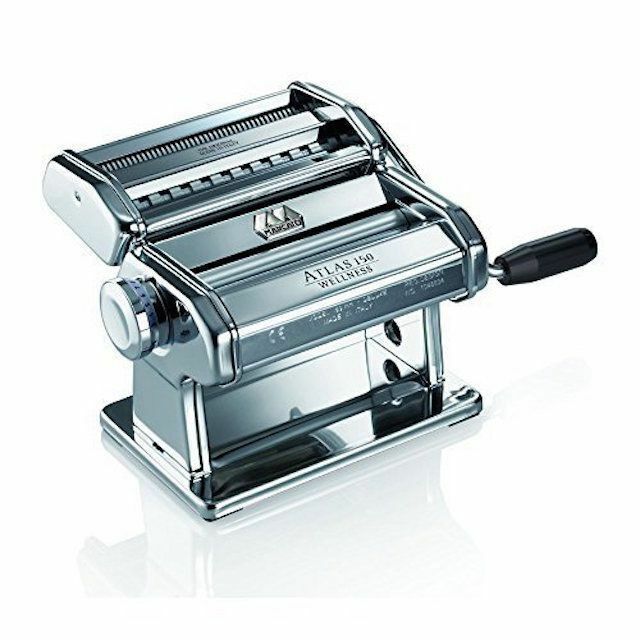 Our reviewers loved how easy and effective the Marcato Atlas Pasta Machine was to use. One tester said that it made pasta-making fun for the entire family and her kids were even able to turn the hand crank. “All three attachments are durable and resulted in beautiful strips of pasta,” noted one reviewer. Organizing all the pasta can get tricky if you're making a lot, so one tester recommended buying a drying rack to help with the process.